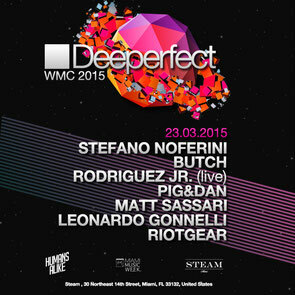 On Monday 23 March Italian dance music label, Deeperfect will be bringing techno and tech-house to Miami as they host an event at Steam as part of the annual Winter Music Conference. Following their pool party at the iconic Clevelander Hotel last year, Deeperfect have decided to move Downtown to one of Miami’s hottest new venues, featuring a full Function 1 Sound System, cutting edge lighting and innovative décor. With a line-up that includes Stefano Noferini, Butch, Rodriguez Jr. (Live), Pig & Dan, Matt Sassari, Leonardo Nonnelli and RiotGear, this looks like another top event at this year’s conference.